The cold front came and went but brought some cold and snow to the upper elevations. High winds dominated the area through the weekend and high pressure and warm weather are now ahead of us. Creeks and rivers at flood level and raging in all areas. Crowley Lake still holding up well with lake level now on the rise. Midge hatches coming off daily with fish scattered throughout the lake. Jurassic Pond fishing well with the big boys coming out to eat. East Walker at 790 cfs. Upper Owens flooded and running high at 114 cfs. Hot Creek high and dirty at 146 cfs. Middle Owens at 767 cfs above Bishop Creek. 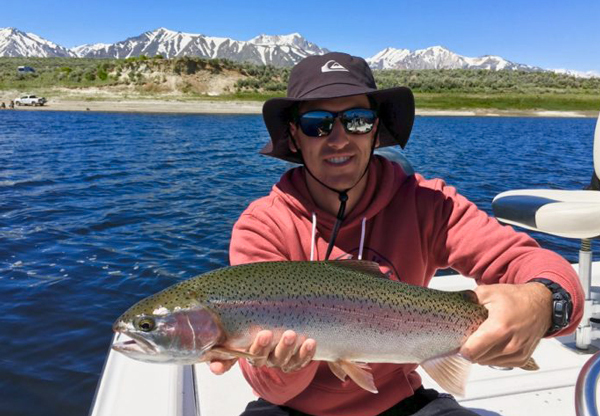 David Frank fished with SD guide Jerry Gilpin and scored this monster rainbow! River running high here at 114 cfs. Down a bit from last week and DF&W expected to plant some trout below the bridge this week. Flooded fields have spawned some unparalleled mosquito hatches. You’ll still need some heavy weight to get the bugs on the bottom if you decide to fish here. Flows now at 767cfs. River still not fishable yet and will remain high for most of the season this year. Flooding still along the banks and areas that haven’t seen water in years now completely covered. Gorge flows have been lowered and fish are spooky. Stealth is mandatory now to get into these guys. PVR has a few nicer sized fish as the river enters the lake. Flows up and rising. Currently running at 146 cfs. Creek is off-color and running fast. Working the edges of the banks is the best bet right now with some weight to get those nymphs down. Flows currently extremely low. Once water level returns to a higher flow fishing will improve. Blown out at 790 cfs. Slight drop from last week. Look elswhere for fishing. Still tough here. I am so sad to report that a Sierra Icon has passed away recently. Our great friend, & eternal buddy Jeffery Wenger has left us. Jeffery operated the Bridgeport Lake Marina and RV Park for many seasons. Jeffery had an insatiable appetite for adventure, & wore many hats during his time. His amazing smile, positive attitude, & constant banter would cast a warm light on all who knew him. He will be deeply missed by myself, & countless numbers whom he made smile. Bridgeport Reservoir will never be the same without him. RIP little buddy. I included a picture of Jeffery with his best friend, “Handy” the horse. He is also shown with another Sierra legend, founder of Mammoth Mountain Ski area, Dave McCoy. You can pick up our flies & Under-cators at Reagan’s Sports in Bishop, the Crowley General Store (not at the lake), Ricks Sport Center in Mammoth (limited selection), Bridgeport Reservoir RV Park (currently closed for winter), Stroud’s Tackle in San Diego. I have added a picture gallery to the website . Click on the “gallery” button and do a search for your name, or scroll through the pages. You can double click on the picture to enlarge it once it is located. Thank you for visiting our website and checking out our report. Be the Fly…. Doug Rodricks, Sierra Drifters Guide Service. Sierra Drifters Guide Service © is trademarked & copyright issued May 4th 2013. No part of this website maybe reproduced, duplicated, or distributed without direct consent from Tom Loe.